These days, Trentham – a small country town between Kyneton and Daylesford – is close enough to Melbourne to be regarded as a commuter suburb. But back in the 1920s, the 97km between there and the ‘big smoke’ must have seemed like light years. The tyranny of distance was enough to put a stop to many promising VFL careers in those times – and Trentham’s Gordon Davie was one of them. Davie was a good Trentham local, the eldest of six children born to parents who ran a fruit and lolly shop in the town. His father, Sam, trained himself as a masseur and acted as Gordon’s trainer in a burgeoning athletics career, and also provided his own rub-downs on footy days. Gordon turned out to be an extremely talented sportsman. His strongest suits were football, where he was a right-footed midfielder, and athletics. He was a fine middle distance runner and finished second in the 1925 Stawell Gift Pleasant Creek Handicap over 440yds. He turned professional at 18 and scored multiple wins and placings in 220, 440 and 880 yard events over seven seasons. As a footballer, he soon won a reputation as a centreman of some renown. He was well built, a fine kick and extremely hard-running, his athletic background serving him well on the football field. 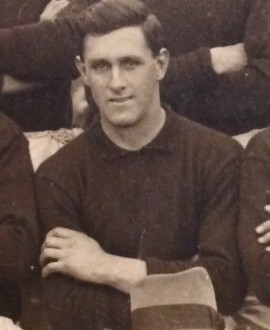 Collingwood had been keeping its eye on Gordon’s development and invited him to train with them during the 1924 season. He was granted a clearance in July and immediately chosen for the Magpie seniors for the Round 12 game against Melbourne at Victoria Park. Such was his reputation that the 21-year-old was named in the centre against Melbourne star Bob Corbett. Davie was retained for the next game against Carlton, this time starting on a wing, but that was where his League career ended. The travel by train to Melbourne and his steady work at Trewhella Bros Foundry in Trentham drew him back home at the end of 1924. In later years he was invited to train with Carlton, Richmond and Melbourne, but again opted to stay in Trentham (although he did take part in a couple of practice matches with Carlton). That turned out to be a very good move for the local footy team, as Gordon captained them to a premiership in 1930. He ended up as something of a local hero, and clocked up his 300th game in May of 1939 – celebrating with a best-on-ground performance. As it turned out, athletic prowess ran deep in the Davie family. A younger brother, Bob, won the Albert Harvey Medal for best and fairest in the Castlemaine District League in 1938, but tore a knee cartilage in his first practice match with Richmond at the start of the 1939 season and ended his footy career. Gordon’s youngest brother, Norm, played at Trentham for 10 years, winning the best and fairest one year and plenty of other awards along the way. One of Gordon’s grandchildren, Ross Fisher, managed a senior game with Melbourne in 1984.
Who knows where Gordon’s career might have taken him? He was an outstanding local player whose career at the highest level would surely have been more substantial had it not been for the once great divide between the city and a small country town.